It’s easy to dislike Michael Bay, the director of The Island and other action packed movies like Pearl Harbor, Bad Boys (1 and 2), The Rock, and Armageddon, not because he’s a bad director, although many say that he is, but because he’s so in love with himself. Michael Bay loves Michael Bay. 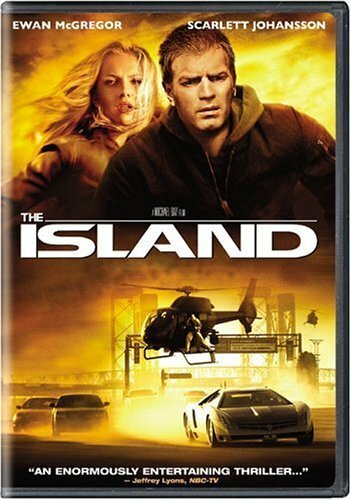 Every special feature on the The Island DVD exists to remind us how smart, clever, and daring Michael Bay is. The first special-feature documentary opens with Michael Bay looking at camera and saying “I told the writers not to write any action [in the script]. Just write the word ‘action’ and I’ll do all the rest.” Oh, Michael Bay. Aren’t you brilliant? Bless you for being the ONLY person who made this movie. The fact is, filmmaking is a collaborative art. It’s the product of a lot of talented people combining their skills to make something imaginative. Together. And to have Michael Bay, or any director for that matter, so happily take all the credit for a film annoys me beyond end. But an inflated ego isn’t Michael Bay’s only problem. Apparently he’s a real tyrant on set as well. Actors learn to hate him. Like James Cameron, Michael Bay sees people as tin soldiers to be ordered around, commodities, set pieces, not as artists themselves. Compare Michael Bay with a much more talented director Ron Howard, aka Mr. Humility, aka “My films are the result of the great talent around me.” Actors love Ron Howard, if for no other reason than the respect he gives them. After the Michael Bay lovefest documentaries, I didn’t even bother listening to the director’s commentary. I typically don’t listen to commentaries anyway, but a commentary that features Michael Bay yapping about how intelligent and ingenious he is — which doubtless is what the commentary was — is even less appealing. As for the film, I loved it. It’s the best film by Michael Bay I’ve seen. Ewan McGregor and Scarlett Johansson are clones, copies of people in the real world, living in an underground research facility just waiting for their organs to be harvested. They don’t know they’re clones of course. They think they’re one of the few survivors of a global contamination, the fortunate few, all waiting for their chance to be sent to the last contaminate-free place on earth, a garden of Eden, the Island. When McGregor learns the truth of the facility, he and Johansson escape. Bullets fly. Engines rev. And lots of running, car chasing, and explosions follow. Besides a few eye-rolling “no one would survive that” moments — such as the heroes falling out of a fifty story building — the film was a pleasure to watch. Lauren loved it as well. A warning for those with weak stomachs: The Island is violent. Weapons used include a nail gun, a large plumber’s wrench, grappling hooks that sink into human flesh, chains, an incinerator, and of course bullets. Lots and lots of bullets. But if that’s your cup of tea, grab a big glass and pop in The Island. You’re sure to get your fill.